"Biohazard" redirects here. For the video game and film franchise, see Resident Evil. For other uses, see Biohazard (disambiguation). The term and its associated symbol are generally used as a warning, so that those potentially exposed to the substances will know to take precautions. The biohazard symbol was developed in 1966 by Charles Baldwin, an environmental-health engineer working for the Dow Chemical Company on the containment products. It is used in the labeling of biological materials that carry a significant health risk, including viral samples and used hypodermic needles. 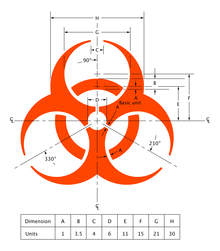 In Unicode, the biohazard symbol is U+2623 (☣). Category A, UN 2814 – Infectious substance, affecting humans: An infectious substance in a form capable of causing permanent disability or life-threatening or fatal disease in otherwise healthy humans or animals when exposure to it occurs. Category A, UN 2900 – Infectious substance, affecting animals (only): An infectious substance that is not in a form generally capable of causing permanent disability or life-threatening or fatal disease in otherwise healthy humans and animals when exposure to themselves occurs. Category B, UN 3373 – Biological substance transported for diagnostic or investigative purposes. 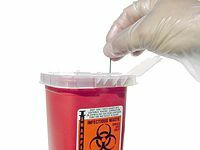 Regulated Medical Waste, UN 3291 – Waste or reusable material derived from medical treatment of an animal or human, or from biomedical research, which includes the production and testing. The United States Centers for Disease Control and Prevention (CDC) categorizes various diseases in levels of biohazard, Level 1 being minimum risk and Level 4 being extreme risk. Laboratories and other facilities are categorized as BSL (Biosafety Level) 1–4 or as P1 through P4 for short (Pathogen or Protection Level). Biohazard Level 1: Bacteria and viruses including Bacillus subtilis, canine hepatitis, Escherichia coli, and varicella (chicken pox), as well as some cell cultures and non-infectious bacteria. At this level precautions against the biohazardous materials in question are minimal, most likely involving gloves and some sort of facial protection. Biohazard Level 2: Bacteria and viruses that cause only mild disease to humans, or are difficult to contract via aerosol in a lab setting, such as hepatitis A, B, and C, some influenza A strains, Lyme disease, salmonella, mumps, measles, scrapie, dengue fever, and HIV. Routine diagnostic work with clinical specimens can be done safely at Biosafety Level 2, using Biosafety Level 2 practices and procedures. Research work (including co-cultivation, virus replication studies, or manipulations involving concentrated virus) can be done in a BSL-2 (P2) facility, using BSL-3 practices and procedures. Biohazard Level 3: Bacteria and viruses that can cause severe to fatal disease in humans, but for which vaccines or other treatments exist, such as anthrax, West Nile virus, Venezuelan equine encephalitis, SARS virus, MERS coronavirus, hantaviruses, tuberculosis, typhus, Rift Valley fever, Rocky Mountain spotted fever, yellow fever, and malaria. Biohazard Level 4: Viruses that cause severe to fatal disease in humans, and for which vaccines or other treatments are not available, such as Bolivian hemorrhagic fever, Marburg virus, Ebola virus, Lassa fever virus, Crimean–Congo hemorrhagic fever, and other hemorrhagic diseases. Variola virus (smallpox) is an agent that is worked with at BSL-4 despite the existence of a vaccine, as it has been eradicated. When dealing with biological hazards at this level the use of a positive pressure personnel suit, with a segregated air supply, is mandatory. The entrance and exit of a Level Four biolab will contain multiple showers, a vacuum room, an ultraviolet light room, autonomous detection system, and other safety precautions designed to destroy all traces of the biohazard. Multiple airlocks are employed and are electronically secured to prevent both doors opening at the same time. All air and water service going to and coming from a Biosafety Level 4 (P4) lab will undergo similar decontamination procedures to eliminate the possibility of an accidental release. Currently there are no bacteria classified at this level. This section duplicates the scope of other sections, specifically, Hazard symbol#Biohazard sign. The design was first specified in 39 FR 23680 but was dropped in the succeeding amendment. However, various US states adopted the specification for their state code. There are four circles within the symbol, signifying the chain of infection. Agent: The type of microorganism, that causes infection or hazardous condition. Host: The organism in which the microorganism Infect. The new host must be susceptible. Source: The host from which the microorganism originate. The carrier host might not show symptoms. Transmission: The means of transmission, mostly direct or indirect. Some routes of transmission include air, insect, direct contact and contaminated surfaces. ^ a b c "Biohazard Symbol History". Archived from the original on February 13, 2012. ^ "USDA Policies and Procedures on Biohazardous Waste Decontamination, Management, and Quality Controls at Laboratories and Technical Facilities". USDA. Archived from the original on March 5, 2017. Retrieved December 17, 2016. ^ Baldwin, CL; Runkle, RS (Oct 13, 1967). "Biohazards symbol: development of a biological hazards warning signal" (PDF). Science. 158 (798): 264–5. Bibcode:1967Sci...158..264B. doi:10.1126/science.158.3798.264. PMID 6053882. Archived from the original (PDF) on 28 September 2011. Retrieved 29 August 2011. Baldwin CL, Runkle RS (October 1967). "Biohazards symbol: development of a biological hazards warning signal". Science. 158 (3798): 264–5. Bibcode:1967Sci...158..264B. doi:10.1126/science.158.3798.264. PMID 6053882. Preston, Richard (2002). The Demon in the Freezer: A True Story. ISBN 978-0-375-50856-1. "Biosafety in Microbiological and Biomedical Laboratories", official CDC guide. "Symbol Making", an account of the development of the symbol in 1966. "BioSeal Systems", Biosafety level 4 containment. "Example of Reclassified Biohazard to Level 4", article from The Lancet concerning the reclassification of Ebola after observation.